I feel a bit guilty this time of year as I watch my neighbors spend days installing their wooden docks. It is not something that one person would want to tackle and usually involves bribing family and friends to help with the installation. Of course, you can hire a company to come out and install it for you, but you’re looking at $500+ per install (depending on the length of the dock) and then another $500 to uninstall before winter. Fortunately, my good neighbor Carl turned me onto an aluminum roll in dock. This dock has eight sections with each section being 16′ in length and 5′ wide. It took me only 22 minutes to install the dock! Below is a video showing just how easy it is to roll-in this dock! Since my initial installation, the water level has risen to a point were I no longer need the end section, so I simply disconnected it and created an L configuration. Moving the sections around is a snap! Because this roll in dock is aluminum, it’s extremely lightweight yet strong and corrosion resistant. 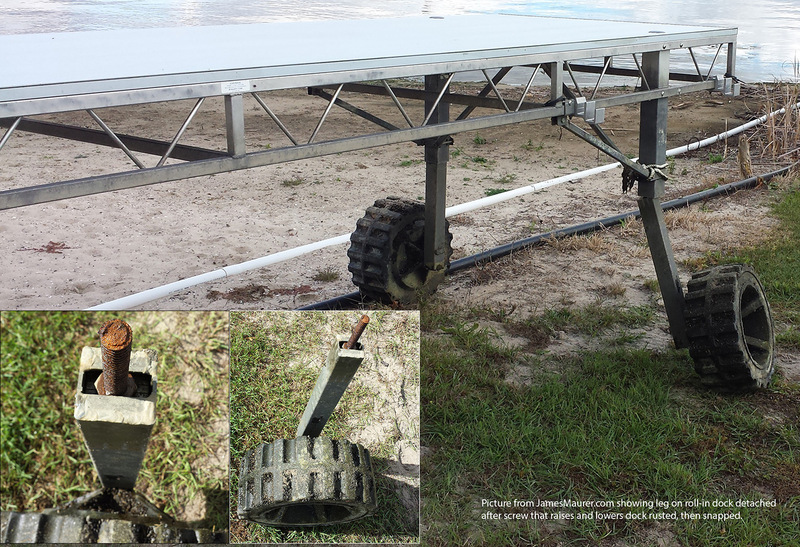 You can adjust the dock using a cordless drill or socket wrench while in the water OR standing on the dock! Wide tires make it easy to move. Each tire has small holes for water to enter that provides weight. Baked-on powder provides a noskid surface and easy to wash off. 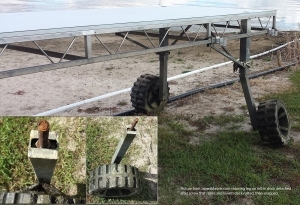 I should note that if you are on a lake with big waves, you can attach two j-screws to each section for added strength; something I had to do with my dock – I have a Tritoon with an upper deck that when combined with wind and waves, puts a lot of stress on the dock! I know this roll in dock will outlive any traditional dock and when it comes to ease of installation, there is no match! Went to contact Northern Lights Marine and the website is now redirected to Northern Lights Docks and Ramps. I see that the new website says: “Previously Northern Lights Marine Systems, the company changed ownership in December of 2013”. I’ve sent emails out looking for help and will post my findings here. I got in touch with the new owner, Mark Shultz, who was very knowledgeable and asked me to send in the dock leg for repair. 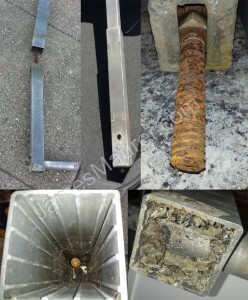 When I originally purchased this roll-in dock at $1,700 a section, I did it because it was maintenance free and didn’t rust – I was never told about having to add grease and figured the screw shown in the picture below would be rust proof as well (there is no way to see the screw unless it breaks). Mark explained that applying marine grease will prevent this from happening and that in the new version of the docks, there are access ports for doing just that. In my version of the aluminum dock, I have a small hole from which to work. Recommended for cutting through the rust. No, you shouldn’t have a problem putting it in or taking it out, but there are times that my tires sink into the sand and requires a good push to get it out. If I were you, I’d tell the dealer you want to test putting it in and taking it out BEFORE you buy and then you’ll get an idea of what to expect. It looks easy in the video because it really is that easy;however, I did it all at once, fast, for the video and that was taxing. If you take your time with the roll in dock, it’s a snap. I want to put this dock in a lake that has a very soggy bottom. Will i have promblems getting it out once it has been in there all summer? Also can two 65 year old women do this easily? Each section was $1,795 and I received a 10% discount. Seems like a lot at first and I bought more sections than I need, but it pays for itself over time and the ability to install it yourself was a major factor for me. The dock is from Northern Lights Marine Systems. The floatable docks looked like they might have worked as well, but the wind and waves can be harsh here! What did it run for that dock? How is the price compared to other docks, such as a floating dock? Is that a chunk of ice floating in the background?? ?